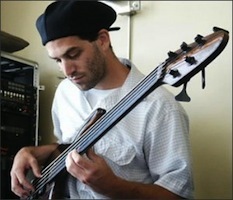 "It’s very hard to explain one of Rob Allen’s basses to someone who has never seen, played, or heard one. 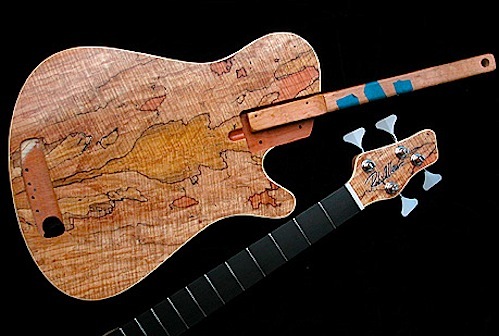 Rob is a rare kind of builder; he has created a niche for himself in the business by following his passion to create instruments based on his own preferences, and his desire to form something unique and original. Part acoustic, part electric, Rob’s basses blur the division between the two. The result is something that exists between the lines, and follows no template other than its own. His instruments are hand crafted by a staff of three in a small Santa Barbara, California shop." "I make instruments because I love doing it, and most people that know me would say I‘m obsessed with it. Purity of design, great feel, and rich organic tone - this is what I try to achieve when making a bass. I think a really good instrument should inspire the player both sonically and visually. There are quite a few basses on the market with a lot of bells and whistles. My idea of bass is more of a “back to the fundamentals” approach, which is why I make simple understated instruments that are each a unique work of art." Rob let me pester him and hang out in his shop a little and on a subsequent trip I decided to commit to having him build me a custom Mouse. He was kind enough to let me pick out the wood for the project, and took the time to explain in detail the nuances, and let me play the corresponding basses he had in the shop to illustrate the fine points. "I have had many questions over the past 12 years regarding what the different woods sound like. 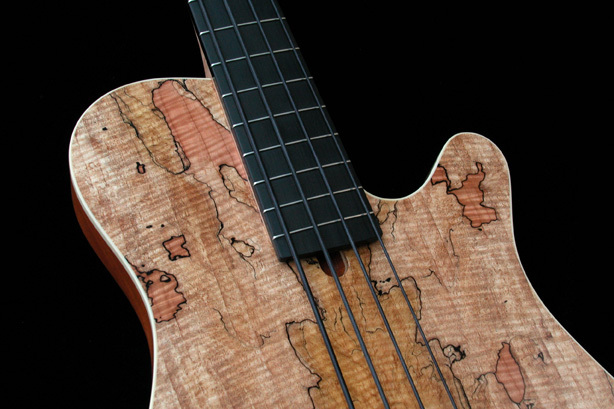 Although there are many wood variations, the basic tone of all the basses offered is about the same within each model, and here is the reason why: the neck and the hollow design of the body, in combination with a wooden bridge and nylon tape wound strings, produce the lion’s share of the instrument’s tone. After making and listening to many hundreds of basses, I have discovered which woods best compliment each other, and each combination is aimed and bringing the tone back to “center” so to speak. For example: mahogany is a warmer sounding wood, maple is brighter, so these two are very complimentary as a mahogany body with maple top. 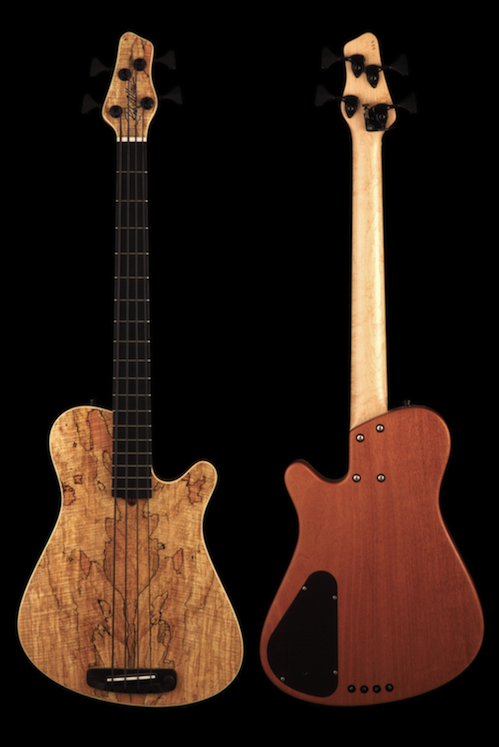 By the same rule, swamp ash is brighter and clearer than mahogany, yet walnut is warmer and softer sounding than maple, so these two combine well also, yielding two different wood combinations that are very similar in tone, yet have a significantly different visual quality. Regarding the top wood, it is thin (just about 3/16” thick) so it doesn’t have too strong of an influence on the tone. 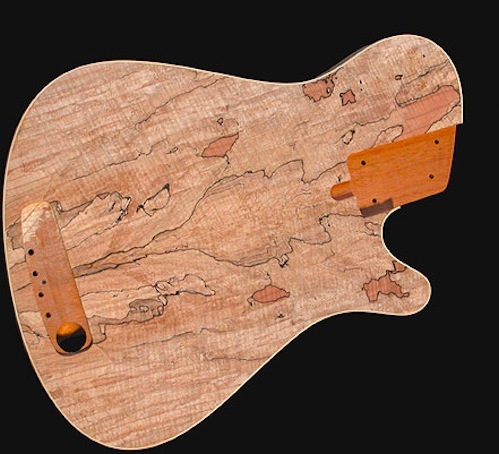 In addition to this, all materials are hand selected for similar weight, appearance and grain structure, and for this reason you will find very little difference in sound between a maple, walnut or koa top. Do they sound different at all? 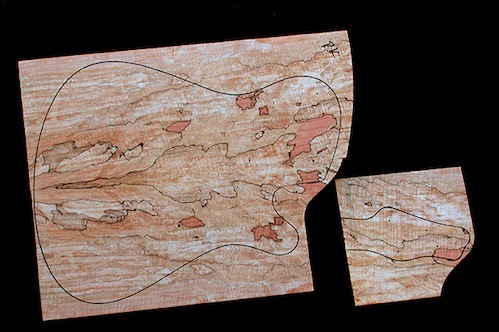 Sure, every piece of wood sounds different from the next, as each bass does, and there can be as much variation between two pieces of the same species. But the differences are subtle, in the case of my particular designs. So I often suggest that people choose the wood combination that appeals to them visually." Rob's designs radiate simplicity. With no tone control, there is only a beautiful wooden volume control built into the bridge. His high quality electronics feature a discreet signal path for pure unadulterated bass tone. The pickups are piezos built in to the bridge saddles of his instruments. I picked out a beautiful mahogany body, heavily figured bird's eye maple neck, and a flamed and spalted maple top with the matching veneer on the head stock. I also chose a very dark rosewood fingerboard - which we decided to dye black to look like ebony. On fretted instruments, I have always found - and Rob agrees - that ebony tends to sound a bit "clacky". Some players enjoy the extra top that the ebony provides, but being primarily a pick player, I prefer the sound of rosewood on the fingerboard. It is smoother to my ear - and compensates for the extra top the frets provide. On frestless instruments ebony is killer and I wanted the look of solid black ebony but the feel and sound of rosewood to compliment the grain of the highly figured body. We also decided on several other custom features, such as a drop D tuner and LED micro lights on the side of the fingerboard which light up when the bass is plugged in. It is topped off with black tape wound LaBella strings which I love. The short scale makes this bass the perfect songwriting tool as you can play it for hours and hours without fatigue. The workmanship on this instrument is a wonder to behold. Here are some shots in progress featuring the spalted and flamed maple used for the top. Many studio pros know the secret of how unique short scale basses sound. The lower string tension provided by the short scale has several benefits - easy playability, sweet upper register tones and fat blooming low end, not to mention the added nuance that comes naturally when playing this type of bass. Unlike most short scale basses available, The Mouse 30 bass is hand crafted to the highest professional quality. The Mouse 30 is a short scale, semi-hollow body bass with an oil finish on it's spalted maple top and a satin lacquer finish on the bird's eye maple neck. The bass features black ultra light tuners and a drop "D" tuner by Hipshot. It also has LED micro lights on the playing side of the fingerboard, which light up automatically when the instrument is plugged in. The body cavity is fully shielded and there is a single volume control integrated into the bridge. This bass weighs in at a very light 6.4 lbs and the width of the neck at the nut is 42mm. Electronically, the bass is driven by a Fishman Matrix piezo pickup which features a discreet signal path for pure unadulterated bass tone. My fretted version features tiny mandolin sized frets and an Indian rosewood fingerboard. Indian rosewood, while certainly a hard wood, is less heavy and dense than the ebony and goncalo alves used on Rob's frestless models. This “softer” wood helps to offset the addition of subtle brightness added by the frets, and creates a beautiful - full yet clear - tone. The bridge is also Indian rosewood and can be adjusted for intonation. The small frets make for a very comfortable feel, and improve intonation due to their low profile, and will last practically forever as the nylon wrapped strings cause very little wear. More on Rob is here. Unique Features: LED Lights which light up the dots on the side of the fingerboard in red – only when the bass is plugged in - drop “D” Hipshot tuner on the E String., 1 5/8" nut with 23/32" string spacing at bridge, overall instrument length 38" and gig bag included.